On Saturday morning, April 27th, join us for a 1/2-mile Family Fun Walk through the Village. The cost is $10 per person with proceeds benefitting the Kisses for Kyle Foundation. Children 12 and under also receive an unlimited bounce house wristband, a free craft, a carousel ride at Giggleberry Fair, and a Giggleberry Fair Activity Pass to use that day or a future visit (no expiration date). Registration: 8:30 a.m., Stretch time: 9:00 a.m., Walk: 9:30 – 11:00 a.m. Guest appearances during the walk by Doc Mcstuffins, Olaf, and PAW Patrol’s Marshall. 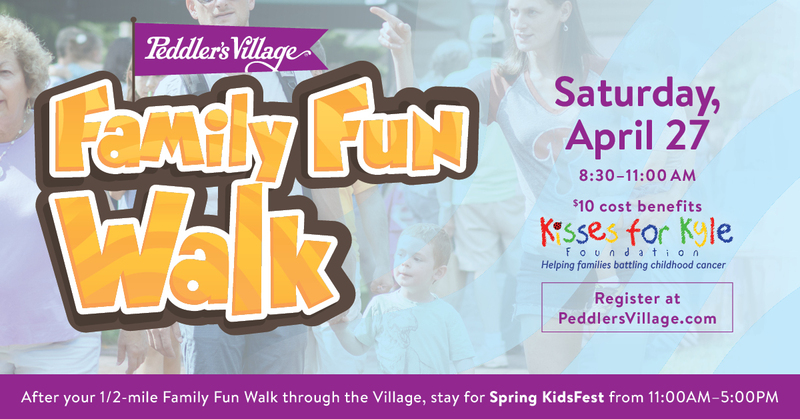 After your ½ mile Family Fun Walk through the Village, stay for Spring KidsFest from 11am-5pm.